Holiday Inn, Downtown Charleston, 1965. The Courtyard by Marriott currently occupies this site. Charleston's Marion Square appears to be an increasingly hot spot of activity for hotels, and it's no wonder with its proximity to all-things-Charleston. Hotels flanking the park include the Francis Marion Hotel, Embassy Suites by Hilton, and the Courtyard by Marriott; newest to the mix is The Dewberry and under construction is the most recent Michael Bennett project. There's some interesting history here in this diverse set of buildings, some things you may not know about. Shall we take a look? On the southeast corner of Calhoun and Meeting, caddy-corner from the park, is the relatively new Courtyard by Marriott. But back in the day, there was a fancy Holiday Inn on that spot, complete with the neon signage (see photo above) that those of us of a certain age tend to remember fondly. The '60s brought Charleston a spate of new hotels and our favorites--motor courts. There were several on Calhoun and Meeting Streets and sprinkled throughout the city. Most are now gone, but a few were re-purposed--the former Downtowner Motor Inn now the College Lodge dormitory on Calhoun in between King and St. Philip Streets is a great example. The Dewberry is the newest kid on the block and its much anticipated Henrietta's opened this week for those of you that keep tabs on the restaurant scene. Have y'all been inside the Dewberry yet? Once inside, you'll have a hard time trying to remember what it used to be like since the interior retains none of its previous look or feel--which is a good thing. The 1960s era L. Mendel Rivers Federal Building was not built for comfort, but developer John Dewberry has certainly changed that around! Anyone heard from the Board of Zoning Appeals regarding their rooftop bar, The Citrus Club? It would be so nice to see the park from another angle, don't you think? The big kid across the park. 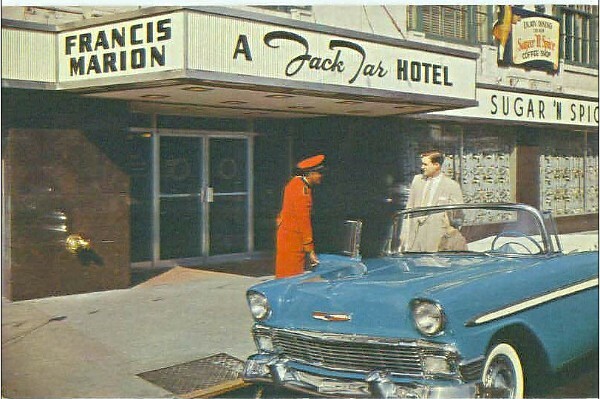 When it opened in 1924, the 12 story, 232 room Francis Marion was the largest and grandest hotel in the Carolinas and in 1952 it became the first air-conditioned hotel in Charleston. Throughout its nearly 100 year run, the Francis Marion (named after the Revolutionary War hero) has attracted a long line of celebrities as guests, including Elvis, Babe Ruth, Doris Day, Bob Hope, and President Dwight D. Eisenhower. Upon retiring from the Citadel in 1965, General Mark W. Clark lived in the hotel penthouse until 1975.It's switched ownership several times--it was a Jack Tar Hotel for a number of years and did a brief stint as a Radisson Hotel--and its success has seen its ups and downs. In the mid-70s, the owners considered converting it into a home for the elderly. In the early '90s, the City considered buying it and leasing it to the College of Charleston for student housing. It sat empty for seven years, badly in need of repairs. Hurricane Hugo took its toll on the structure, although it was in those beautiful ballrooms on the second floor (where local schools hosted proms) that we had to take our paperwork for FEMA. Mayor Riley led the efforts to raise money for the 1996 $12 million National Trust for Historic Preservation award-winning restoration. The revival of the Francis Marion is regarded as the catalyst for the revitalization of upper King Street. Way to go, Joe! The oldest kid in the neighborhood. 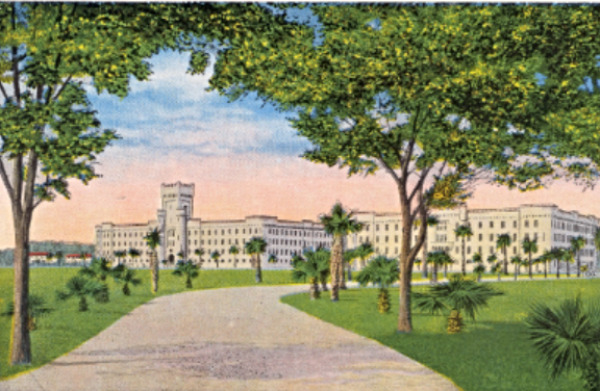 About a century before the Francis Marion Hotel was born on Marion Square, the South Carolina State Arsenal was constructed and staffed with 150 men "to act as a Municipal Guard for the Protection of the City of Charleston and its Vicinity." The impetus for the Arsenal was the Denmark Vesey slave revolt in 1822. The Arsenal was formally converted into the SC Military Academy in 1842 and the campus was soon referred to as the Citadel because of its fortress-like appearance. Union troops occupied the campus for several years after the Civil War, but in 1882 it was reopened as a military college and operated in this location until relocating to its current campus in 1922. For most of the 20th century, the eastern-most building was utilized by Charleston County--y'all might remember going there to Voter Registration or something. In 1994, it was completely renovated and re-purposed into the Embassy Suites by Hilton and it is gorgeous. But while the main campus had moved, the Military College still used the west wing of the Old Citadel for faculty housing. You probably know someone who grew up there on the corner of King and Hutson Streets through the end of the 1950s. At that point, the west wing, which had been built in 1854 and rebuilt in 1889 after a fire, was chosen as the site for a new free library. The west wing of the Old Citadel and the library that replaced it. It may shock some to read this, but the question of whether to renovate or tear it down was a contentious and divisive one. In the end, new construction won and then the great design debate began. Another hot issue, you can surely imagine. The building was to be built with steel, concrete, and masonry--with lots of glass. The Preservation Society of Charleston immediately voiced their objection to the building, saying that it was not in keeping architecturally with the rest of the city. The papers were flooded with letters, both for and against the building plans. A 1958 N&C editorial asked, "Must public buildings be glass and steel bird cages? What's so good, after all, about modernistic design that reduces home and factory, church and school, office and library to the same pattern: a flat roof, unrelieved masses of concrete, and strip windows?" Indeed. In the last stages of construction, some of the glass was replaced with marble--pink marble, at that. Many were very upset. But alas, we had a new library and even if one didn't like the building, it was hard not to love that library. Query anyone who grew up downtown in the 1960s and 70s (or 80s for that matter) and they will likely show some nostalgic fondness for the old building. 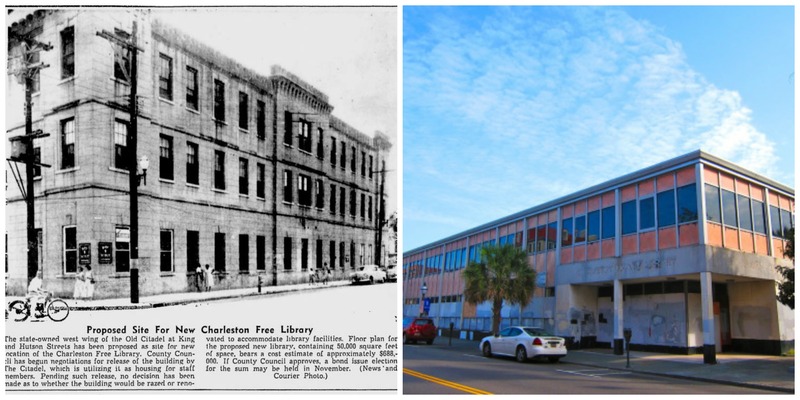 So when the new library on Calhoun Street was opened, speculation began as to what the old library would be used for (other than the scariest haunted houses ever). Well, you know the rest of the story. Bennett Hospitality, who owns the Embassy Suites on the other side of the park, as well as the Hampton Inn right next door to it (an 1860 railroad warehouse better known as the Chico Apartments) bought the old library in 1995. With the last ten years spent planning and going through the state Supreme Court, the newest hotel on the park is underway. The projected opening is August, 2017. Crossing our fingers that it will be a good neighbor! 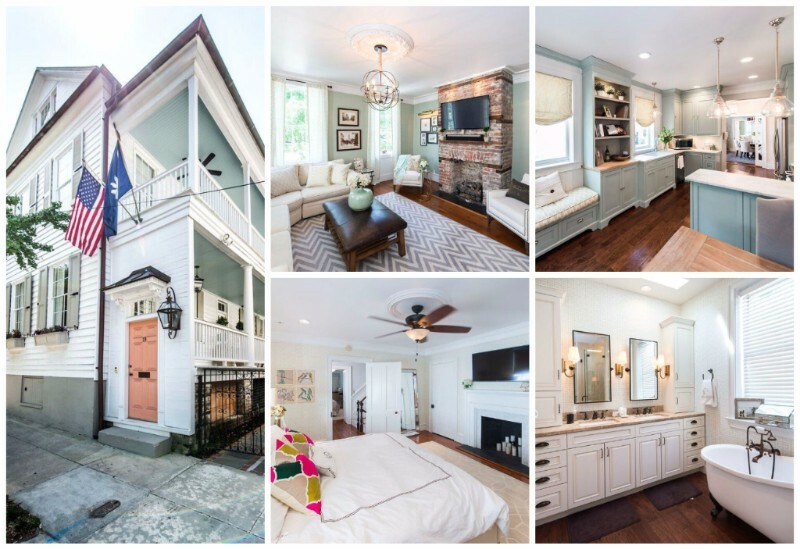 Lois just listed this 1852 Charleston single house just down the way from Marion Square at 19 John Street. The four nearly identical two-and-a-half story homes at 17-25 John Street were constructed by wealthy builder William Henry Houston and rented to a succession of clerks, clothiers, and craftsmen. This gorgeous home is a must-see, so call or text Lois at 843.270.2797 or shoot her an email at lois@loislaneproperties.com to schedule a showing. Want to see what else is available in Wraggsborough?